Christine Moore and her family lived a dream life rescuing horses deep inside Ohio’s Amish country. But when her neighbors began leasing their land for fracking, her peace of mind gave way to a mental tug of war. Fracking has yet to become a household term, but it is close. Known more formally as hydraulic fracturing, it is a relatively modern and highly controversial form of natural gas drilling. The process works by injecting large quantities of water, sand and industrial chemicals into the ground in an effort to break up shale rock deep underground and release natural gas. Proponents of fracking laud it for its ability to access vast deposits of natural gas used to generate power. Critics decry it for of its environmental impact, which include reports of groundwater contamination, air pollution and earthquakes. It is also a thirsty process, requiring upward of 5 million gallons per well, which is often pulled from local reservoirs and streams. Christine Moore and her family formed their own opinion about fracking when the gas industry knocked on her door about a year ago and changed their lives forever. The Village of Sugarcreek, known locally as the Little Switzerland of Ohio, sits deep within the rolling hills of Ohio’s Amish country. The town center is built along a few narrow blocks, flanked by small eateries, a gift shop, a grocery store and an area for horse and buggy parking. The air is sweet, and the wind zips the clouds by so fast you can watch the shadows sweep across the land. The natural gas boom sweeping across the Utica and Marcellus Shale in southeastern Ohio brought fracking to Sugarcreek about two years ago. Christine lives in a farmhouse just over the hill from town. On any given day, she could be found in the big, red barn, tending to animals she loved, including horses she rescued from slaughterhouses. She spent hours each day with the horses in the barn, a landmark on their property. Eventually, though, it became an icon of what Christine lost in a battle she knew she would never win. Despite environmental concerns, including the truck traffic and water withdrawals, the Moore family saw their neighbors, one by one, lease their farmlands for fracking. 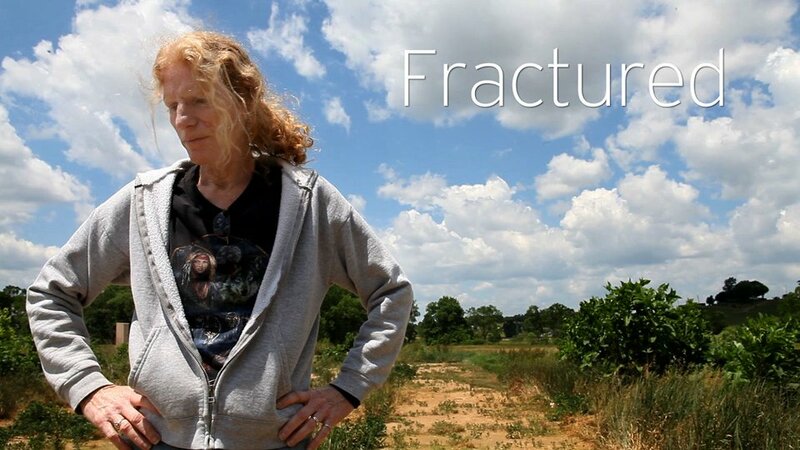 When a well was fracked five miles from her house in January 2012, Christine broke down. “Our little town is going to be completely destroyed,” she said. Christine went door to door, begging her neighbors not to lease their land for fracking. But most of the town, many Amish and Mennonite, did not listen. Some in the town even spat at Christine, and one person told her to “go home and take a nap,” she recalled. Two months after the well near her home was fracked, Christine suspected the worst: Her water appeared to go bad. An oily film became visible across the surface of the water in her horses’ bowls. And, Christine said, the water inside her home—pumped from her well and filtered through a softener—began giving her severe stomachaches. In December 2011, before the nearby well was fracked, Christine had her water tested to establish a baseline should it become contaminated. That test revealed her drinking water was safe. She has yet to retest her water for drilling chemicals. When her water appeared bad, Christine acted. She sent her horses to a no-kill shelter in upstate Ohio. When the horses left, all joy left her home. Christine stopped growing food in her garden, Kenny no longer played outside, and her husband felt the itch to move. Her next decision would be whether to move her family or to stay and fight. “I don’t think I should have to sell my dream and give everything up,” she said, before admitting that this may be a battle she likely would not win. In July, the Moore family watched from inside their house as their neighbors, amid a row of horses and buggies in the driveway, bid for the home they had worked so many years to build. In the space of a few minutes, the auctioneer accepted a bid, and their home was gone. The property sold to their next door neighbor, Jerry Jacobson. According to Tuscarawas County records, he has oil and gas exploration leases on multiple properties. Ironically, he said he wanted it for the barn to stable his daughter’s horses.